Brown cotton twill corset with the bones covered with a darker cotton twill, black fabric covered busks and a trimming of black machine-made cotton lace. Lined with white cotton twill and the top and bottom are bound with reddish brown tape. The corset is made in two parts. The front fastens with a busk and the backs are provided with metal eyelets for a lace. 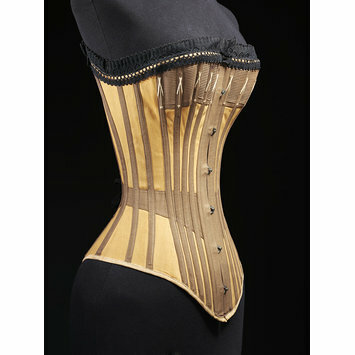 The corset is hip length, curving to a rounded point in the front and less deeply at the back. The bones are close-set and splayed out at the bust and hips, and at the tops are trimmed with fancy stitching in cream. There is a band of dark brown cording at the top, covering the breasts. At the waist there is a V-shaped band in darker brown stitching. The corset is machine-stitched. With metal fastenings. Inscribed in pencil, attached to the lining on the left side of the back on a red on white printed label. During the 1890s, it was fashionable to be voluptuous at the bosom and hips, but small at the waist. Tight corsets aided this by displacing flesh from the waist to these areas. This corset has one of the smallest waist measurements in the collection of the V&A. 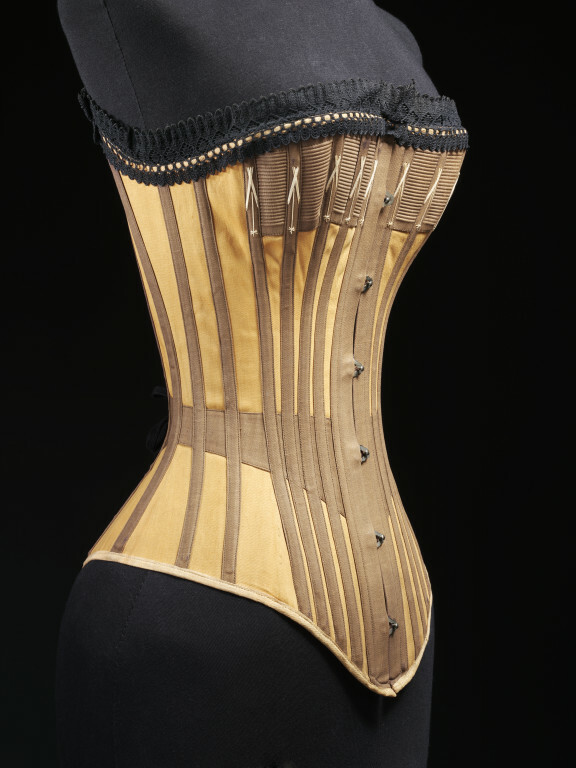 Most surviving corsets show a generous or 'normal' waist measurement, suggesting that creating the right shape, not size, was the main purpose of corsetry. During the 1890s it was fashionable to have a small waist and a full bosom and hips. When this corset is laced tightly its waist measures just under 48 centimetres. Today the UK standard size 12 waist measures 71 centimetres. The 'belt' of dark brown cotton, which wraps the waist, was designed to reduce the risk of the whalebones breaking at this notorious stress point.